Discover the wines of Italy’s Veneto region with a 1-hour tasting in an enoteca in Venice. Meet your local expert at the wine bar and learn about the long winemaking history of Veneto, which dates back to the Roman Empire. 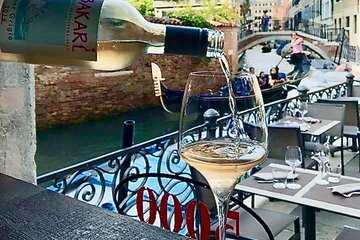 Taste several different Veneto varietals served with house-made appetizers as you enjoy the social atmosphere of this small-group tour. Conozca a su experto local en Enoteca Estro en la calle Crosera, donde tendrá lugar su degustación de 1 hora. Acomódese en su asiento y aprenda sobre la región del Véneto que rodea a Venecia, conocida por sus blancos claros y rojos debido a un clima más suave. Pruebe cuatro vinos diferentes de la zona y escuche mientras su guía aclara los complejos sabores que juegan en su copa. Compare los sabores del rojo refosco con el marzemino de cuerpo completo, pruebe el Prosecco ligero y burbujeante, y pruebe los blancos de Veneto populares como manzoni bianco, friulano o soave. También disfrutarás de cicchetti, bocadillos venecianos tradicionales, para complementar el vino. Cada plato pequeño se combina con un vino diferente y, mientras que las opciones varían, puede esperar delicias como las flores de calabacín fritas, baccala (bacalao de sal tradicional) o arancini (bolas de arroz). Después, siéntase libre de quedarse en el bar para disfrutar de más vino y comida de Veneto por su propia cuenta. Awesome selection although we did not have someone discussing the wines to us which we like. Great selection of wines and finger food! I really enjoyed the location for this wine tasting it was a beautiful, modern bar with a variety of wines. The price for this tasting is very high for the 4 small tastes and 2 nibbles. We were attended to quickly, however we were hoping to get more information about each varietal, vineyard, etc. and did not get much beyond the name of the wine. We were a little rushed in order to accommodate the dinner time reservations it would have been nice to linger longer. I highly recommend visiting Estro, though I'd pay individually for each pour/snack for a better overall value. I am pretty sure anyone could show up at the bar and ask for a sampling of wines - there was no group and no real experience. The wines were okay but i wouldn't do this again. There was no one there to meet us at the designated time. We called the on the page and the person on the phone just told us to go inside. The place was closed and the doors locked. They called the bar and a lady opened the door. She had us go sit and wait for about 15 min, while she did other things and attended other patrons walking in. The tasting consisted of 4 wines, 2 white/2red and 1 bite to go with each one. No explanation other than if it was dry or sweet, and that whites go with fish, reds with meat. After the wine was poured2 at a time, the lady told us she was leaving us to look at the bottles... Most of the time, we were left just sitting there. I, personally, do not recommend this wine tasting experience. There are so many other bars with better wine, food, service, and personality. Not worth the money and time. We felt there was a switch and bait element to our evening which turned out to be Four glasses of wine at a bar in Venice. No one met the group at the appointed meeting point and two members of the party never found the tiny bar, which would not give any value for the 100 . Good wine good food and a explanation of each wine. Really good food, cute atmosphere, not difficult to find and really nice staff. Unfortunately we were the only ones there and did not receive too much information on the wines and dishes served. Otherwise- really delicious food and worth staying for dinner afterward! Very enjoyable. The restaurant was a little out of the way but we enjoyed seeing a new area of Venice. We tasted 4 wines, including one white, one prosecco and two reds. All glasses of wine were generous (about 100ml). The accompanying tapas were delicious and filling. We were there about 2 hours. Great evening - I was the only one on the tour but the staff at the restaurant were fantastic!